Pack your bags and get ready for an unforgettable journey through the natural beauty and thrilling adventures of South America. Guided through the eyes of local experts, you will have the chance to admire extraordinary sights and uncover remote hidden treasures. Embark on an epic overland adventure through the heart of the Atacama Desert and traverse into the Altiplano plateau as your expedition takes you in regions experienced and known by few. Enjoy a custom trip with fascinating excursions and unique lodging experiences catered to your own interests and requests. As the perfect platform for adventure discovery, this expedition is sure to leave you hooked and wanting more! Today, you will be picked up from your hotel to embark on a Half Day Tour of Santiago, beginning at the bustling Mercado Central. This well-renowned market, popular with both locals and tourists, supplies many Santiago homes and businesses with fresh fish and produce year round. Next, you will make your way to the Plaza de Armas, Santiago’s main square and kilometre zero, the point from which all distances in the country are measured. Famous architecture in the square includes the Metropolitan Cathedral and the central post office, originally built as a house for Spanish conqueror Pedro de Valdivia. Close by, you will find the Justice Tribunal in a neo-classical building housing the Supreme Court, ex-Congress and beautiful gardens. This morning, you'll be met by our driver in your hotel lobby and transferred to the airport in time for your domestic flight to Calama to begin your Desert Adventure. On arrival in Calama, you'll be met by a hotel representative to transfer you to your hotel. * Please note that this flight is not currently included but we can assist upon request. From wide, flat saltpans, to jagged mountains and an overly-dry atmosphere, there are few matches to Atacama's beauty in South America. Atacama's alien landscape continues for miles and miles in every direction. Traveling here very much feels like removing oneself from society, from civilization, from everything. Its expansiveness allows for tons of activities from hiking to off roading, so despite the huge emptiness of the high plateau, you'll never run out of things to do. Today you will visit Salar De Atacama and Altiplanic Lagoons. The Atacama Salt Flat is the largest salt flat in the whole of Chile at around 3,000 km². It is also unusual in that while most salt flats in the world have a smooth, crisp surface, the top layer of the Salar de Atacama is churned up and pitted, since unlike the others it is never covered in water. It does, however, have a sinkhole lake which is so salty it creates a similar floating effect to that found in the Dead Sea. 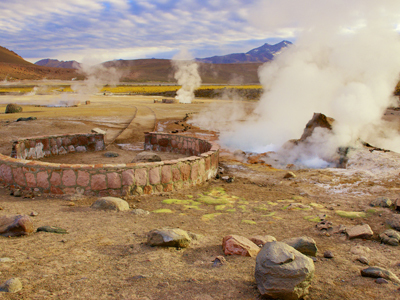 The very early wake-up call from the hotel will be well worth it when you arrive at the Geysers of Tatio and see them in action. From almost 900 meters below the earth, boiling steam bursts up to 40 meters over the surface of the earth. A scrumptious breakfast will be served upon arrival before we walk through the geothermal fields with the geysers erupting nearby. As you return from the Geysers, you'll witness a magnificent view of the Tocopurri and Sairecabur volcanoes. 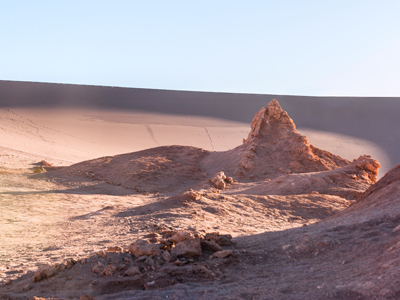 San Pedro de Atacama is the archaeological capital of Chile, not only are its landscapes part of the region's appeal, its history will also enrich your stay and your experience. This morning, you will visit the most important archaeological sites in the area and will travel to the past to learn about the origins of the Atacameña and Licanantai culture. At an Atacameña Farm, you will see how a family combines the ancestral traditions of agriculture and livestock with tourism, and have the opportunity to taste some locally produced products. Then, you'll head to the Village of Tulor, the oldest settlement in the Salar de Atacama basin and one of the first indicators of sedentarism in the region. Finally, you will move to the center of San Pedro de Atacama to travel back in time to the first colony, where one of the most symbolic constructions is the Church of San Pedro, built of adobe this church has been miraculously preserved to this very day. After lunch, you'll head to discover the Yerbas Buenas Valley, which is the junction of the Domeyko mountain range, the Salt mountain range and the Andes. Here you'll observe petroglyphs from different ages, and then continue your journey to the Rainbow Valley, which is full of colorful mud caused by the diverse minerals found in the soil. 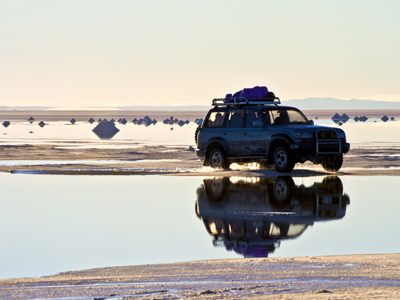 Your 4x4 expedition with a drive from San Pedro de Atacama to the Bolivian border crossing Hito Cajones. Once you cross the border, the scenery will be dominated by the Licancabur Volcano and the Green Lagoon at its base, one of the jewels of the Eduardo Avaroa National Reserve. You'll continue driving and enter the Valley of the Desert Ladies, then head to the Hot Springs of Polque for a relaxing bath in the natural hot pools before making a visit to the Sol de Mañana Geysers. After breakfast, you'll wander the hotel grounds and Pueblo Quemado, which was burnt down in Bolivia's war with Chile in 1879. After, you'll help out a local llama herder by the name of Doña Marta round up the heard and have a chance to get up close and personal with these iconic animals. You'll then board your 4X4 and drive an hour to the abandoned hamlet of Cuye. Continuing on to Incahuasi island, you'll have great views of volcanic rock and giant cacti as you make your way up to a viewpoint of the surrounding white landscape. Here, you'll enjoy some lunch as well as an optional walk up to a panoramic viewpoint for an incredible full 360º view of the Salt Flats below. After breakfast, you'll drive past the Tunupa Volcano, which sits at 5,321 m (17,457 ft) above sea level. From here, you'll head on to Salinas de Garci Mendoza, at the foot of the volcano, where you'll visit a local village and church representative of the colonial architecture. Continuing on to the Jayu Quta crater, you'll see a huge depression caused by a meteorite that fell millions of years ago. Due to its vast size and symmetry, the crater is known as Maracaná in reference to the famous football stadium in Rio de Janeiro. Your final lunch will be in Quillacas, which will provide you with one last stunning view of the surrounding lakes and salt flat. A city scraping the clouds, La Paz's altitude will take your breath away as much as its beauty. Thanks to immigration from all over South America, but mainly Peru, La Paz is one of the continent's fastest growing cities. Look into the mountains, and you'll be lucky to see a space not occupied by hastily-constructed homes. This fast-paced growth sometimes means that beautification has not yet caught up to utility, but the classic parts of the city boast a colonial style to be proud of. Lively markets, trendy restaurants, and fascinating museums are all popping up around the city, and its people are excited to be a part of the boom. This morning you will be met at your hotel to begin your half-day tour of Bolivia's capital city - La Paz. First visit the famous Witch Doctor's Market, San Francisco Colonial Church and the typical handicrafts of the Sagarnaga Street. The tour continues to Plaza Murillo where the Cathedral, the Government Palace and the National Congress buildings are located. Then, visit the famous colonial street Jaen where interesting museums are clustered together, followed by a visit to the replica of the semi-subterranean temple of the Tiwanaku Culture. To change scenery the tour continues to the residential areas of Obrajes, Calacoto and La Florida. The tour ends with a visit to the unique Moon Valley, where passengers will have the opportunity to walk around, and visit a ceramic workshop with a demonstration of the art of pottery. Le Rêve sits amid the embassies and private mansions on a quiet street off the bustling Avenue Providencia. Sister property to the business-oriented Hotel Plaza San Francisco, it’s only a 15-minute stroll to boutiques in Santiago’s colonial heart for shopping, or a short cab ride to the upscale Vitacura and Las Condes restaurants for dinner. The four-story town house has a Parisian facade of beige stucco with shutters and wrought-iron railings, and plushly papered corridors with etchings of formal French gardens. The 31 rooms continue the Gallic theme with a penchant for ornamentation: gilt-framed botanical prints, bronze curtain pommels, velvet-and-suede bedcovers, and enough pleated rope, tassels, and adornments to start your own shop. La Casa De Don Tomás is located in the magical surroundings of the rich archaeological zone of San Pedro. It has applied the charm of the typical Atacama architecture making the hotel a refined, pleasant, and comfortable place. La Casa De Don Tomás offers maximum comfort, quality, and service in its spacious rooms with private bathroom. The interior rooms have cozy living rooms, decorated with rustic furniture in willow wood. Wake up to the fresh air and enjoy the pool on a hot summer day or sit on the terrace with a wonderful view overlooking the volcano. In harmony with this Andean landscape, the Tayka del Desierto Hotel opens its doors to welcome visitors from all over the world, offering the opportunity to visit one of the most beautiful places in South America, the Eduardo Avaroa Flora and Fauna Reserve, where there are the wonderful Lagunas de Colores, the Sun Geysers of Tomorrow and the Stone Tree. In its construction, volcanic stones carved for the walls were used and an architectural design specially designed to tolerate the intensity of the desert climate. Solar energy is used and there is also a heating system based on radiators that circulate hot water and emit heat. The hotel also offers food service in the restaurant, from where our passengers can enjoy a wonderful view of the majestic Siloli Desert. Have you ever imagined yourself being in a magical landscape as white as the clouds in the sky? This place exists, and it is located in one of the most famous natural beauties of South America. The Hotel Tayka de Sal is located on the north bank of the Salar de Uyuni, at the foot of the Tunupa volcano and at an altitude of 3700 meters above sea level. Its location next to the Salar, the Tunupa Volcano and the town of Tahua allows you to make short walks in its surroundings and familiarize yourself with the regions surroundings. 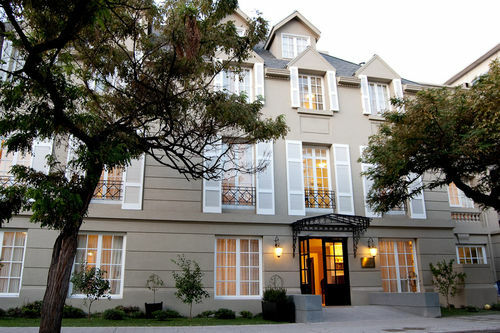 Set in a colonial-style building only 20 meters from San Francisco Square, La Casona Boutique Hotel offers rooms with free Wi-Fi, a restaurant, and a pleasant and convenient stay with Camacho Avenue located just 150 meters away. After 8 years of restoration, La Casona was declared by the local authorities as an architectural heritage site of the city of La Paz for its colonial architecture dating back to the 17th century. Decorated with parquet floors and gabled roofs, rooms at La Casona are fitted with fans, air conditioning and heating. All have private balconies overlooking the city. A buffet breakfast is served daily. Free visits to El Tapado Museum can be organized. Massage can be requested, and bikes can be rented to explore the city. La Casona Hotel Boutique is also just 15 km from El Alto International Airport. This is just one of many authentic travel experiences offered by Global Basecamps. If you are interested in more unique destinations to Chile with unprecedented planning and extraordinary service visit our main Chile tours page to browse other sample trips.